Unlike typical cooktops, induction ranges utilize magnetic induction rather than electricity or heat to warm pots and pans. Many people prefer commercial induction ranges over standard ranges due to their added safety — induction cooktops stay cool while in use, which can help reduce burns and injuries in the workspace. What’s more, induction cooking promises more even and fast cooking, which makes it great for bustling food service establishments. 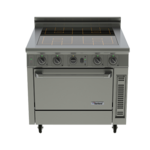 CKitchen.com has a huge assortment of induction cookers that you can use to help make your business safer and more efficient. We offer models by Garland, Adcraft, Electrolux, APW Wyott and more. Single induction cookers are the perfect choice for those looking for a simple way to add an extra cooktop to the kitchen without having to install a brand-new range. 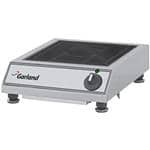 These electric cookers plug directly into a standard outlet and provide a reliable surface for frying, boiling, sautéing, simmering and searing. Because these units are self-contained and portable, they’re a popular option for off-site catering, food trucks, food carts, concession stands and other food service operations requiring portability. 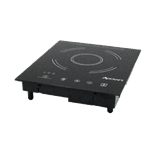 We also have large-scale range induction tops with multiple burners. These options are great for larger restaurants and commercial kitchens. In addition to highly versatile commercial induction cookers, CKitchen.com also offers induction wok ranges that are specifically designed to accommodate woks. Rather than a flat cooking surface, the burner is slightly recessed to fit the unique size and shape of a large wok. You can use our induction warmers to safely keep plates hot before being served, especially during catering or buffet applications. Unsure which induction range is best-suited for your unique needs? When you shop with CKitchen.com, you always get personalized customer service, so we’d be more than happy to assist you with finding the right unit.